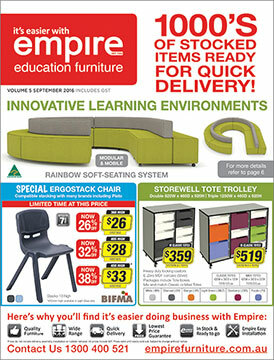 We have just released our latest education furniture offering to schools in Qld and NSW featuring 1000's of in stock items ready for immediate delivery. The brochure features many new and innovative products to meet your school furniture needs. The Acer Table range has 12 different shapes that can be put on fixed height frames and height adjustable frames, with some shapes that can also be put on bench high frames and flip frames, Castors or levelling feet are an option on most frame types. 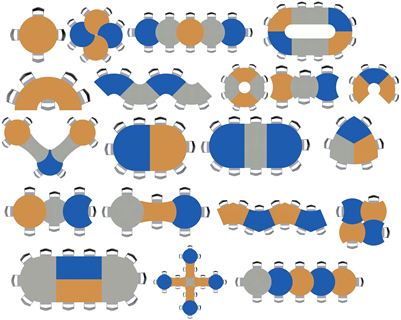 Many of the shapes nest with others to make different configurations to aide in collaborative learning. The unique height adjustable leg system guarantees there will be no rattling of the frame. The star PODZ Ottomans range is the Flower setting, comprising of a Centre piece ottoman surrounded by 5 Petal ottomans. All of the PODZ ottomans are constructed with an E0 MDF structure clad in Perspex for added strength, and come standard with our ball bearing castors with rubber feet. We are confident with this construction that we have the strongest ottomans in the market. Also featured is the Rainbow lounge. 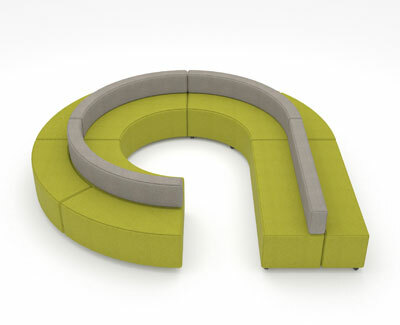 This consists of 4 pieces - straight and curved, both with and without backs. 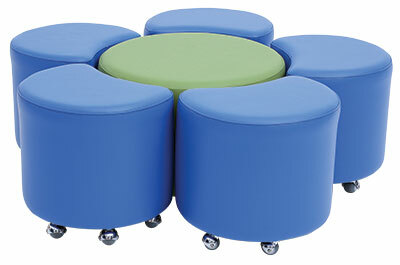 With this system you can make many different shapes and configurations to accommodate different class sizes.